Today, architects and designers are beginning to look toward developments in new "smart" or "intelligent" materials and technologies for solutions to long-standing problems in building design. However, these new materials have so far been applied in a diverse but largely idiosyncratic nature, because relatively few architects have access to information about the types or properties of these new materials or technologies. 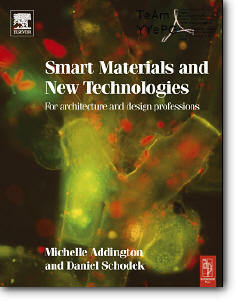 Two of the leading experts in this field - Addington and Schodek - have solved this problem by incorporating all the relevant information of all the latest technologies available to architects and designers in this one volume. They present materials by describing their fundamental characteristics, and go on to identify and suggest how these same characteristics can be exploited by professionals to achieve their design goals. Here, the wealth of technical understanding already available in the materials science and engineering literature is at last made accessible to a design audience. * Benefit from the knowledge and insight of this experienced and respected author team.